A continent is a large area of land on earth. 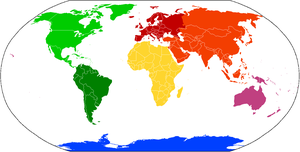 It is generally agreed that there are seven continents — Africa, Antarctica, Asia, Europe, Oceania, North America, and South America. Sometimes Asia and Europe are considered one large continent called Eurasia. North America and South America are sometimes together called the Americas. Oceania may also be called Australia and Oceania or just Australia. Asia is the largest and most populous continent. It also contains the highest point on earth, Mount Everest, and the lowest point on land, the Dead Sea. This page was last edited on 14 May 2014, at 07:43.